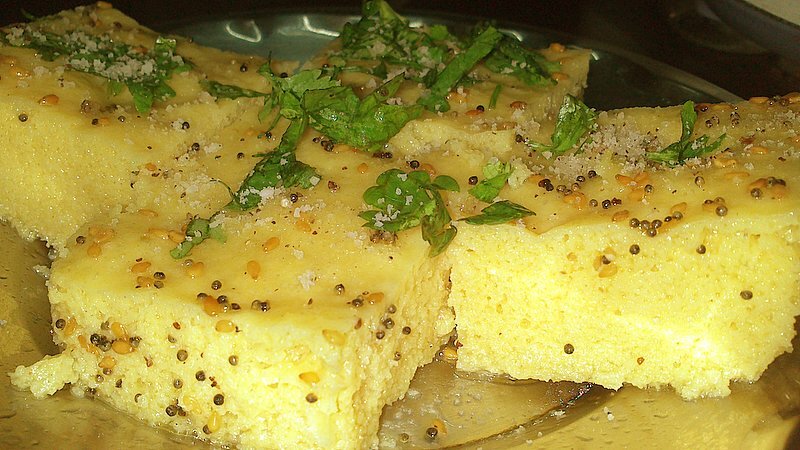 My hubby is mad about them and everybody outside Gujarat knows these Khaman as Dhokla and love them. My colleagues at Hyderbad too were no exception and requested me to make them, so i learnt how to make this instant variety of Khaman also known as Nylon Khaman. Before that i had never made them, as nobody at my home is particularly fond of them, we all love our fermented Dhokla (The one with rice and daal) and vaati daal na khaman. 1)Take Besan, Salt, Sugar, Turmeric powder, Citric Acid and soda in a mixing bowl and mix well. 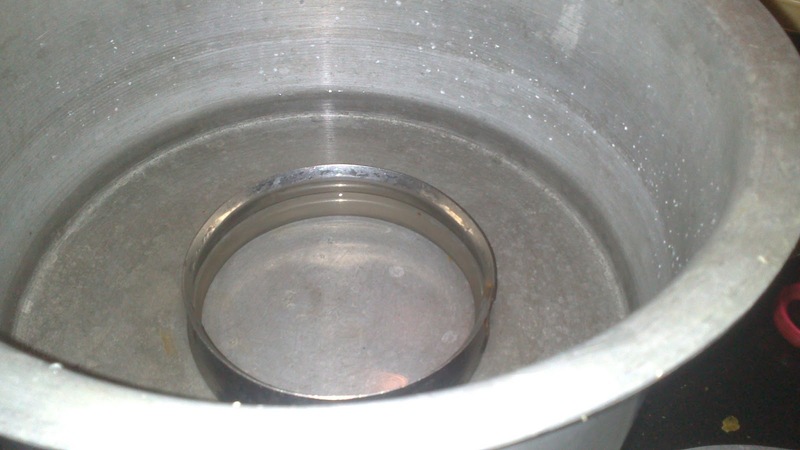 3) Because of combination of soda and citric acid, you will see that your batter becomes frothy. 4) Now, keep it aside for 10 mins. 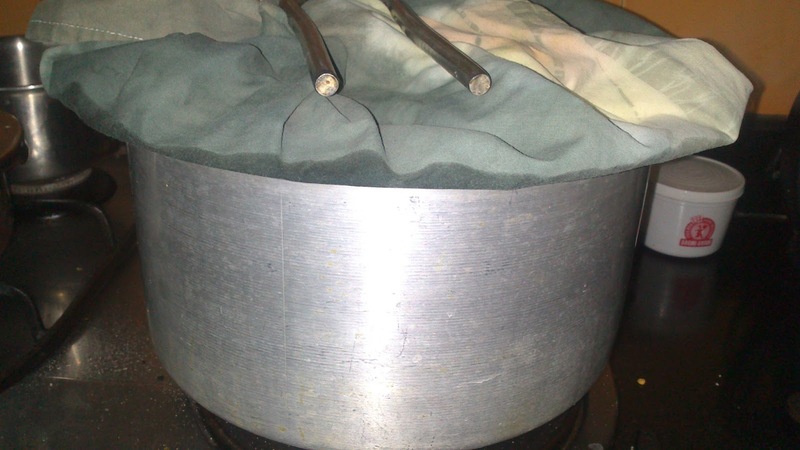 5) Meanwhile take a big pateela (deep pan), take water in it, put a stand inside(or a bowl on which you will be putting your khaman plate) put it on a medium flame. Cover it using a lid (Wrap the lid in a cloth to avoid soggy khaman). 11) For Tadka, Mix water, lemon juice and sugar in a bowl. 12) Then in a kadai, take oil, add mustard seeds. 13) Once they crackle, add Til, let them crackle then Add hing and turn the flame off. if using green chilies then, add the cut green chilli pieces carefully. 15) Mix the Tadka properly and pour it on the cut Khaman. Now, what if you don’t have the big pateela and other taam-zaam for making the khaman?!?! Don’t loose heart, you can use your Idli stand instead. And recently i was telling my neighbour P how to make it and told her that Khaman needs to be steamed, so she came up with this brilliant idea of steaming it in Rice cooker, so if you have a rice cooker you can steam khaman in that!!! In place of big pateela, you use rice cooker, everything else remains exactly same!! !but don’t forget to cover the lead with a cloth). once the Khaman shaped as Idli gets steamed and cooled, take them out in plate, or bowl and cut into squares. Then proceed with the Tadka and pour it over these khamans and enjoy!!!!!! khaman looks so spongy and perfect!!! How to make khaman in microwave and what will be the settings? I generally don't make khaman in microwave mode. But from the book i have, you make them at medium power for 7-8 mins. Still i would suggest that you make them in a traditional way, as microwave tends to dry out the food too much. Hi..could u please tell how much water did u add in thè batter?